In 1898 the steamship Colombia met its fate near Pigeon Point. But soon a new Colombia took its place on the international waters, commuting between Central America and San Francisco. 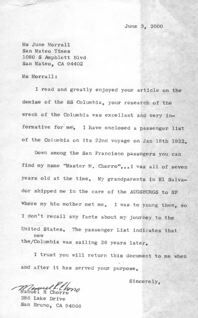 In the year 2000, I received a letter below from a passenger who was aboard the new Colombia. “I have enclosed a passenger list of the Colombia on its 22nd voyage on Jan 18th 1922. “Down among the San Francisco passengers you can find my name ‘Master M. Chorro’…I was all of seven years old at the time. My grandparents in El Salvador shipped me in the care of the AUGSBERGS*** to SF where my bio mother met me. I was too young then, so I don’t recall any facts about my journey to the United States. The passenger list indicates that the new Colombia was sailing 26 years later. I don’t know what “Augsbergs” means. This entry was posted in Colombia, Manuel Chorro. Bookmark the permalink.